So I mentioned in earlier posts that I've been having problems with a dead trigger after some hard and fast reloads in my M&Ps. 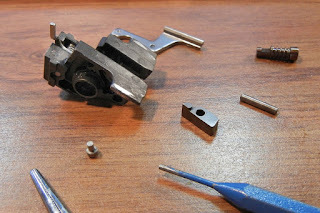 I spoke with Apex Tactical last week and they said that it was probably caused by sear bounce and that I needed to replace the sear spring with a larger one (1/8th inch). They also suggested that I replace the sear housing block cuz the old ones may not be able to take the larger sear spring. So I ordered two new sear housing blocks and two larger sear springs. I installed them in both guns today. Now I just need a semi-warm day at the range to see if this worked. I sure hope it did.